All right, then, what is Chronicles? Is it King Tut out of the tomb when I was three? Norse Eddas when I was six? And Roman/Greek gods that romanced me when I was ten? Pure myth. If it had been practical, technologically efficient science fiction, it would have long since fallen to rust by the road. I’ve never been a big reader of science fiction, largely because, rightly or wrongly, my perception is that SF worships at the altar of technology, and is fixated upon cold, clinical subject matter for which I have little interest. But if the SF genre contained more books like Ray Bradbury’s The Martian Chronicles, I might view it a lot differently. The Martian Chronicles tells the story of mankind’s colonization of the red planet. Driven by curiosity and the impending destruction of a worldwide atomic war, men send rocket expeditions to Mars in hopes of settling the planet and finding a place to carry on their civilization. It’s not a traditional novel, but a collection of short stories originally published in Planet Stories, Thrilling Wonder Stories, and a handful of other defunct SF magazines, which Bradbury ties together with a series of vignettes. The Martian Chronicles was first published in 1950 and Bradbury set the first story, “Rocket Summer,” in a fictional (and then-distant) 1999; this latter printing advances the timeline to 2030. The Martian Chronicles certainly has some SF surface trappings, and the tale “There Will Come Soft Rains” (a haunting story about the aftermath of an atomic war) probably fits that category. But it’s certainly not hard SF. Bradbury doesn’t dwell on the Martian technology nor describe how it works. What little there is described in Bradbury’s inimitable short strokes of brilliant, poetic color: Houses with tables of silver lava for cooking bits of meat, pillars of rain that can be summoned for washing, metal books that sing their stories, like a fine instrument under the stroke of a hand. 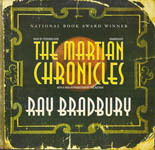 Rather than explaining the hows and whys of rocket travel, or the describe the atmospheric conditions of the red planet, Bradbury uses The Martian Chronicles to explore the age-old problems of colonization/colonialism, our fears of the unknown, our longing for simpler times, and the limitations of science and technology. It’s intensely elegiac, an ode to the quiet towns and neighborhoods of the 1920s and 30s, before the sprawl of cities and suburbs and the opening of the Pandora’s Box of atomic power. The heart of the book is the short story, “And the Moon be Still as Bright,” which concerns a fourth rocket expedition to the red planet. The first three missions have failed. Mars is empty, its cities ghostly and vacant. The Martians have been hit hard by chicken pox, infected by the crew of one of the previous expeditions. 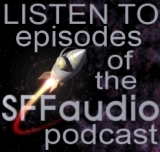 When several crewmembers of the latest expedition get drunk and vandalize a beautiful Martian city of glass spires, one of the crewmen, Jeff Spender, turns on them in a murderous rampage. It’s interesting to note that the Martians are not perfect, and in striving for balance they may have lost something. In “Ylla,” the second story/chapter of the book, a Martian woman upsets her husband to the point of murder. As the Martians are telepathic, Ylla is able to “speak” to the astronauts as they draw near in their silver rocket. She learns their burning desires and their strange songs. Despite the harmonious, tranquil, idyllic environment all around her, the brown-skinned, golden-eyed Ylla wants to be swept away to earth, crushed in the embrace of the white-skinned, dark-haired, blue-eyed Nathaniel York. For all its piggishness and destructiveness, the race of men is passionate, burning with the desire to live and explore. 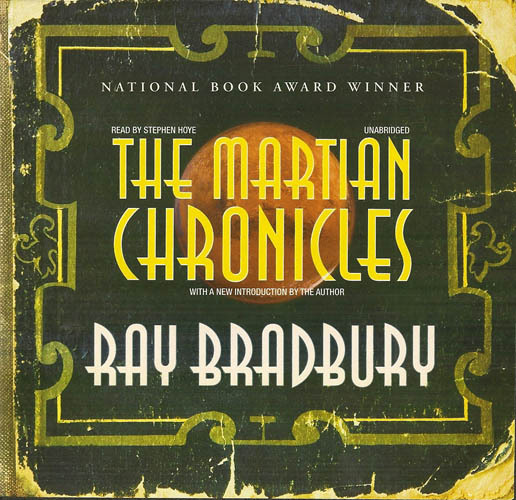 As with all of Bradbury’s tales, The Martian Chronicles contains its share of humor, terror, heartbreak, and hope, and is written in Bradbury’s beautiful, one-of-a-kind style. It holds a deserved place as science fiction classic, even as it transcends the genre and defies our attempts to categorize it.